Great news for everyone who is going to pre-register! Register by December 31st and get another $5 off each registration! Also, I hope there will be a few up for a great cruise down again on June 2nd! John and Mike, you in? Times, places, etc... from last year good? This year I'll be driving from Lincoln, ME (hour north of Bangor). I'll either leave real early or stay at a friends for the night in Springfield, MA. Unfortunately, no Feature for me to show at Carlisle yet. Almost got that one in CO, but got an irresistible deal on a Florida Highway Patrol car before making my final decision about it. Not sure what I'll be bringing to Carlisle, but I may be trailering my '84 L w/ 34k miles to sell. Either way, I will be going with something! I'm in! I also blogged this sale. I registered on Saturday and just booked a hotel. A little more expensive than last year (+$10/night) but I will keep checking the rates. I'm also in for the ride down. The timing and meeting places of last year worked out good. Last year was so much fun. Meeting everyone was such a pleasure. I can meet at the same place that worked out good for me. I need to go. My kids want me to assemble some more toys. Kind of figured you'd be one step ahead of me John! I too hope you can ride with the top down! When I first read that, I thought to myself, I really NEED to get a yellow/black/5spd! Would look really nice driving down the road... red... white... and yellow! Ugh... summer can't come soon enough! Back to almost two feet of snow. Hotel at the Fairfield in is reserved for Friday and Saturday. As always a great time to catch up with everyone and check out all of the cool Fords. Although the show is awesome, I also enjoy hanging around the town as there are Fords EVERYWHERE! The hotel parking lots are like mini shows! Hope alot of people can make it this year. Always a great time catching up with everyone. Same as last year... cruising down on Thursday before Carlisle! All are invited and travel will be from ME to PA and everything in between! Mind if I put a TWF logo on the site John? If so, what would you like me to use? No problem. How about this? The official page will be here once I update it from 2010 to 2011. Thanks! Added it to the site! I should be able to make this one guys, Ken & John hope to see ya guys there again. John, will you be selling the TWF stickers there or are they only available online? Yes, I will have them at Carlisle. I just found out I have a MAJOR conflict this year. My daughter, who has been taking dance lessons since September, is having her recital that Saturday night!! I will not miss it so now need to work out the logistics on how I can do both. Will keep you all posted as I really enjoy the show but of course need to figure out how to be in two places at once! OK, I am really resisting the temptation to tell you that it might be a good opportunity for your daughter to learn about the disappointment that life sometimes brings. But, that just wouldn't be right. Thanks for the heads up. I'm sure cloning will be worked out by then. I didn't know if I would make it or not. I have had to put a new radiator and new springs and struts/shocks on it this spring. Now all I have to do is get in inspected and a four wheel alignment and I am go to go. That's great news Jim. What days will you be there? Just posted the show field map with our tent location here. 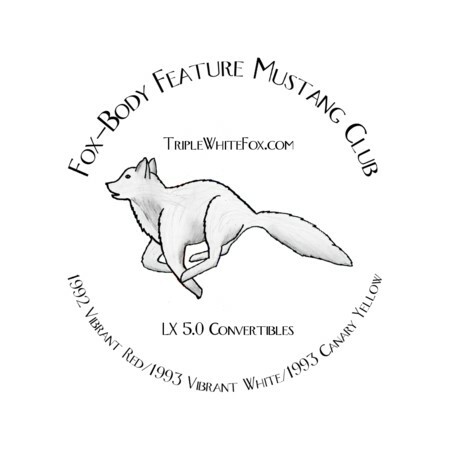 This year we are listed as the "Fox-Body Feature Mustang Club" to be more true to our general purpose and focus. In past years it was TripleWhiteFox.com which may have been confusing to some. The list of attendees is relatively short right now. If you would like to be added to that list, please let me know via email. I have tried to track everyone who has committed to come but I may have missed some. I didn't even assume to see you 'regulars' so I think that list will be minimally 2 or 3 more. Playing the mad scientist right now trying to get this cloning thing done!! Right now it is not looking as good as I would have liked. If I come down it looks like I can not get there until late Friday night and will have to head on the highway by 2pm Saturday which makes for a very short day. Still working out some more details and I still have my room reserved, so still hoping I can pull a rabbit out of the hat!! Keep you posted on my participation this year! Thanks. I certainly understand your situation. John taking the 86 GT this year. I'll stop by and say hi and we can meet up at the same pub Friday night if you want. I'll see you there. Have a safe drive down. Sounds great. I definitely would like to go out. And, feature car or not, you are welcome to hang out at the tent all weekend. Amy, that's great to hear! How many are going to be there Friday? I may be able to swing a Friday only show. Not ideal but I really want to be back in Carlisle this year! Well I know that at least two of us will be there. Mike P. and myself. Sorry, John, I forgot to reply to this. I will be there Friday and Saturday. I am looking forward to it! That makes at least three of us on Friday. I will be there Friday, Saturday and possibly Sunday. Thanks, Amy. Looking good for Friday. I think there will be at least 5. Ahhh so jealous!! I just added you to my twitter account so I can virtually be there. Yes, I tried but just could not swing a day trip there Friday and Saturday was just going to be too crazy to head over and then race back to NJ to see my daughter's recital. This will be my first year to miss since 2007!!!! Six feature cars today. Two triple whites, two yellows and two reds. Only one was not a club member but was nice enough to join us. A couple more were parked with the Yellow Mustang Registry and a couple 7-up cars were around. At the start of the day my feeling was that Carlisle attendance could be down this year due to various reasons including gas prices. That didn't seem to be true today. Overall, there were a lot of cars for a Friday. Attendance seemed good. I hope that holds true tomorrow. Given that Saturday is the busy day, we are planning to arrive around 7:00 AM. Highlights for Saturday look to be the Coyote swap and the Ford Parade and Street Party to be held in downtown Carlisle. Ken! Shame you won't be there this year. It would have been nice to see ya again. Unfortunatelly, this will be a one day stay for me as I have to be in NYC sunday afternoon. John and the rest of the gang, I'm planning to leave my house in Laurel, MD around 5:30 Sat morning so hopefully I'll make it to the fairgrounds before 8. Someone save me a spot with the club . We're still registering as Triple White Fox correct? C ya guys tomorrow!!! PS never mind, I saw we're registerd as fox body feature mustang club.